This Freescale Freedom board is based on the KL27Z64VLH4 which is a 48MHz device from the ultra-low-power KL family with Cortex-M0+ core and USB. This KL27 device has 64k Flash and 16k SRAM and is in a 64 pin LQFP package, whereby the KL27 is also available in 32 or 48 pin QFN, 36 pin XFBGA or 68 pin MAPBGA) and its memory ranges from 32k ..256k Flash and 8k ..32k SRAM. There is a 32kHz crystal on the board for clocking the part. uTaskerSerialBoot_FRDM-KL27Z_KBOOT_HID_UART_MSD.bin KBOOT compatible USB-HID loader with composite USB-MSD loading, as well as KBOOT UART loading on UART 0 at 57'600 Baud [17.0k] allowing applications to be loaded at link address 0x6080 (using Freescale's KBOOT USB connection, or KBOOT UART at 57'600 Baud or USB-MSD when the board appears as upload hard disk). When operating, the green LED blinks at 5Hz. To force the loader reset the board with the push button switch SW1 held down. To disable the watchdog reset the board with with push button switch SW2 held down. This can be loaded using the FRDM_KL27Z's USB-MSD (OpenSDA) boot loader. Note that the loader limits application sizes to 38k - it can be built without limits using the µTasker project. uTaskerV1.4.8_BM_FRDM-KL27Z_6080.bin FRDM-KL27ZM application with command-line menu on the virtual COM connection (115'200 Baud) with various menu items (as well as on LPUART0), including the ability to switch to USB-LPUART-0 bridge mode with end-to-end flow control. Output from the on-board accelerometer can be viewed in the I2C menu. Low power modes can be set in the application menu. The USB device is a composite USB-CDC with 3 interfaces plus HID mouse. Mouse movement in the left and right directions can be tested by using the two push buttons SW1 and SW2. Drivers that can be used for this device are available below. The processor runs at 48MHz [35.3k]. Linked to 0x6080, this binary image can be loaded with drag-and-drop onto the upload disk that appears when the serial loader is operating or using the KBOOT loader's USB or UART connections. When the application is running the green LED blinks at 2.5Hz. uTaskerV1.4.8_FRDM-KL27Z.bin The same FRDM-KL27Z application as stand-alone software that can be loaded using the FRDM-KL27Z's USB-MSD (OpenSDA) boot loader [36.3 k]. uTaskerFreescaleMultiVirtualCOMx3.inf CDC installation file for 3 CDC interfaces plus mouse - 32-bit windows. uTaskerFreescaleMultiVirtualCOMx3_64bit.inf CDC installation file for 3 CDC interfaces plus mouse - 64-bit windows. The following µTasker V1.4 application configures for a USB-MSD device with SD card support (USB_INTERFACE, USE_USB_MSD and SDCARD_SUPPORT). This enables the utFAT on the SD card and makes it accessible from a USB host, with support for the interface in the disk interface menu as disk D.
The following image shows the FRDM-KL27Z being simulated together with an SD card. An executable is provided which requires no installation and can be started by extracting and simply executing the file uTaskerV1.4.8_FRDM-KL27Z_SD.exe. The device's UART can be connected to using a virtual loop back device to COM4 and then the SD card can be viewed, formatted, directories and files created, renamed, deleted etc. in the utFAT Disk menu (DOS-like interface). 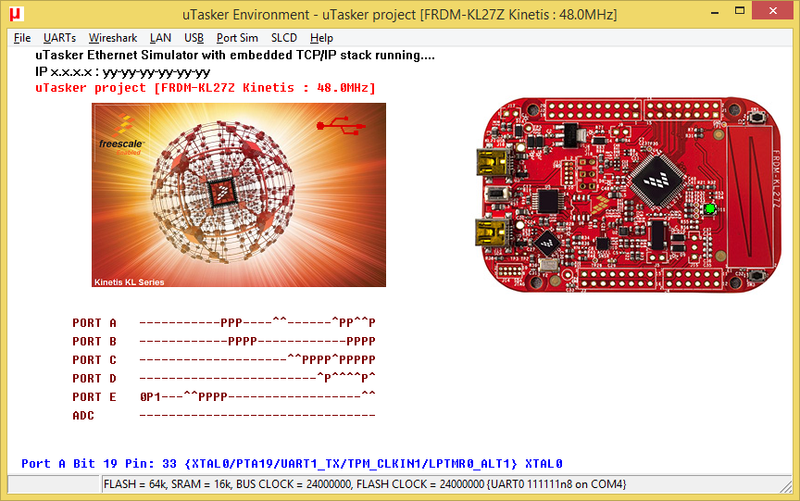 uTaskerV1.4.8_FRDM-KL27Z_USB-MSD_utFAT.bin FRDM-KL27Z standalone application that can be loaded using the board's OpenSDA loader [53.3k]. uTaskerV1.4.8_FRDM-KL27Z_SD.zip Simulation of FRDM-KL27Z and SD card. 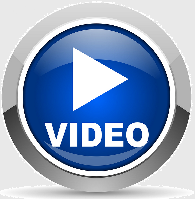 The following µTasker V1.4 application shows emulated FAT in operation, meaning that it appears as a hard drive to a PC host and allows viewing linear data content. The application is discussed in the document µTasker - FAT Emulation, although this configuration doesn't use a large area of the internal flash for data storage and formatted viewing (due to smaller size of Flash in the KL27) but instead allows a raw display of its entire internal Flash memory and a snap-shot of its internal RAM. The USB device operation uses the crystal-less USB mode. uTaskerFreescaleMultiVirtualCOMx4.inf USB CDC installation file for 32-bit windows (usable for up to 4 USB-CDC composite interfaces with MSD). The following µTasker V1.4 application shows the board being clocked from its internal LIRC (8MHz) oscillator with system clock set to 4MHz and bus/flash to 1MHz in order to be able to use VLPR (and VLPW [Very Low Power WAIT Mode]) modes. It was configured by setting the defines RUN_FROM_LIRC to configure the basic clock mode, #define SYSTEM_CLOCK_DIVIDE 2 to obtain 4MHz system/core speed, #define BUS_CLOCK_DIVIDE 4 for 1MHz bus/flash in order to respect the maximum VLPR mode frequencies. The LUART is set to 19'200Baud so that an accurate speed can be obtained from the available clocks, whereby the LPUART is also driven from the LIRC (controlled by LPUART_MCGIRCLK). The Timer module (TPM0 channel 2) is configured to generate a 1kHz 20% PWM signal on PTC3 (J2-15) and the TPM also clocked from LIRC (controlled by TPM_CLOCKED_FROM_MCGIRCLK)). The following µTasker V1.4 application shows the board generating regular messages on its LPUART1 output (PTE0 - J3-1). This uses the UART_TIMED_TRANSMISSION_MODE as described in the UART user's document. This allows defining DMA driven UART output with a very accurately defined inter-character space, generated with a PIT timer's DMA trigger for zero-overhead operation. The KL27 runs at 48MHz (from its 48MHZ internal clock) with 24MHz bus/Flash clocks. It appears as a USB-CDC device (using crystal-less mode) and has a command line menu on this and its LPUART0 on the OpenSDA VCOM interface. Various further functions can be used in the menus. Since the application task is operating in polling mode the low power modes are blocked. 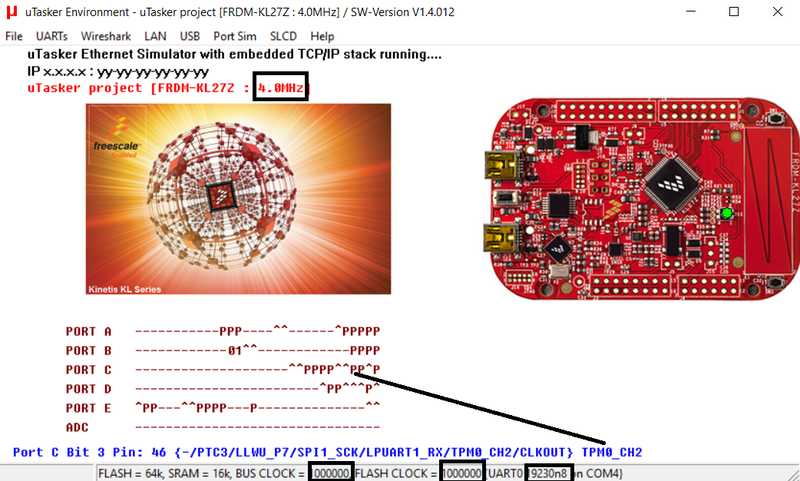 The following µTasker V1.4 application shows LPUART0 (OpenSDA VCOM connection) using free-running DMA for reception. This uses the options SERIAL_SUPPORT_DMA_RX and SERIAL_SUPPORT_DMA_RX_FREERUN and the application reference FREE_RUNNING_RX_DMA_RECEPTION. In addition, RUN_IN_FREE_RTOS, FREE_RTOS_BLINKY and FREE_RTOS_UART combines with FreeRTOS to run both the uTasker and FreeRTOS tasks in parallel. A FreeRTOS UART task uses the uTasker LPUART driver to demonstrate echoing back receptions from the free-running UART DMA by the task (also using DMA for transmission). When the firmware operates the green LED blinks at 2.5Hz (controlled by the uTasker watchdg task) and the red LED blinks at 0.66Hz (controlled by a FreeRTOS task). Low power modes are blocked when operating together with FreeRTOS.